Service Rank and Number / Rheng gwasanaeth a rhif: Lance Corporal No. 22453. Military Cemetery/Memorial / Fynwent milwrol: Mendinghem Military Cemetery, West-Vlaanderen. Ref No Grave or Memorial / Rhif cyfeirnod bedd: Plot 1. Row C. Grave 20. Died of wounds on Monday 5 February, 1917 aged 30 years. John Herbert Hughes was born in Conwy, North Wales during January 1887. The 1911 Census shows that the family lived at 20 Marsh Road, Rhyl, Flintshire. The head of the family was Maria Hughes (nee Gregory) a Widow aged 50 and her five children – Robert Oakly Hughes aged 30, who was employed as a Railway Shunter, Richard Hughes aged 28, a Railway Carriage Examiner, John Herbert Hughes aged 24, a Hotel Servant, Jane Gregory Hughes aged 21, a Shop Assistant and Mary Blodwen Hughes aged 18, who was also employed as a Shop Assistant. At some stage the family moved to 20 Railway Terrace, Rhyl, Flintshire. Following the outbreak of the First World War, John enlisted at the Recruitment Centre, Rhyl with 15th Battalion, Royal Welsh Fusiliers. He died of wounds on Monday 5 February 1917 at Ypres, Belgium. On 3 December 1919, a payment of £9. 0s. 0d. was made by the War Office to Mrs Maria Hughes, which is recorded as a War Gratuity payment. 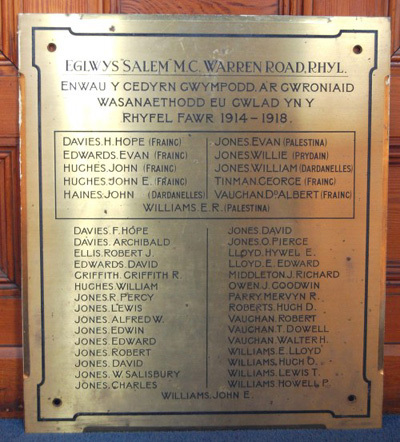 John Herbert Hughes is also remembered on a Remembrance Plaque at The Royal Alexandra Hospital, Marine Drive, Rhyl, Flintshire and on The North Wales Heroes Memorial Arch, Deiniol Road, Bangor, North Wales. There is a Flintshire Roll of Honour card for him at the County Archives Office, Hawarden, Flintshire, which is unsigned but dated 12 September 1919.